Chicagoland Photographer | Palm Springs in Chicago — CHC-Photography, Inc.
We been on Green withdrawal for a few months now and since Spring was nowhere to be found, we took matters into our own hands and went to Garfield Park Conservatory to enjoy blooming florals, cacti and tropical palm trees. On this shoot I got to work with one of my regular favs Madeline Raspe of Mad About Hair and with another talented NWI Artist Melissa Marshall of Makeup by Melissa. Our models were Alli McDaniel who found me on IG and Emilie Meyers. For Alli’s blown eyes we decided on green tones for her make-up with a twist of purple and yellow and for Emilie we chose coral tones to enhance her green eyes. Maddie, a.k.a. Queen of Braids, did some loose pinned back waves for Alli, different braided hairstyles on both girls and even whipped out a head scarf for one of Emilie’s looks. The styling was the right mix of boho and bada**. 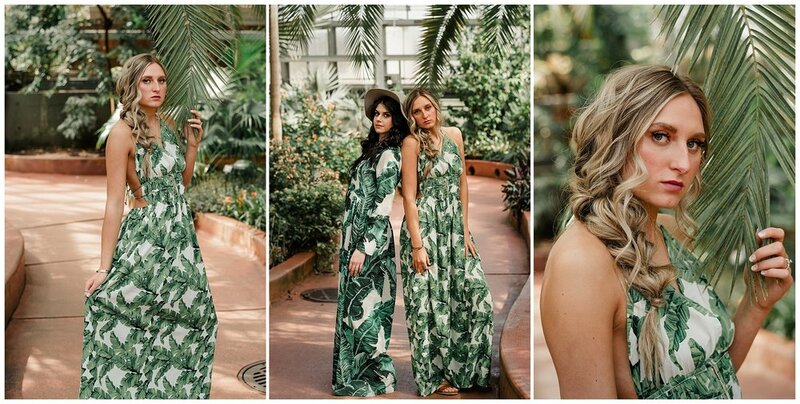 I had ordered a couple palm leaf dresses for myself for summer and since the dresses I ordered for this shoot didn’t get here in time, we used those and they actually worked out great. The models brought their own jeans and we styled them on the fly and Maddie is so fast she changed the hair three times. We were only there for a couple hours . . . every minute got busier and busier at the Garfield Park Conservatory and we got pretty lucky to get a lot of shots without people in it. How gorgeous did these girls look?!! The surrounding colors complimented their hair and make-up perfectly. Our models looked effortless and carefree . . . just absolutely stunning. The temperatures in most of the conservatory were very warm and it felt amazing being surrounded by greens and flowers. What a way to recharge your energy after months of seeing gray and beige … make sure you go visit when in the Chicago area. Although sunny, outside it was cold and windy and it was the perfect spot for our shoot. I can’t wait to go again soon because I am totally in love with this place. We all had such a great time together and I love these kind of play dates . . . always leaves me inspired! Thanks everyone for being part of this fun shoot! Spring we are ready for you!